The location, the staf so friendly and helpful , the break fast-food was delicious and so organized in the morning. No mini bar in the room but you can put your food and drinks which you want to keep them cold at the bar's reception refrigerator any time even in midnight. The staff is very polite and helpful. There are free services, e.g. when you forgot your toothbrush or other hygienic things you'll get them at the reception at no extra cost. Directly behind the hotel is a Rewe supermarket where you can buy almost everything important and at the next crossing is a subway station. The bathroom has a big shower and is big enough to be used by two persons simultaneously. The bed and the couch are extremely soft and bouncy which we found very pleasing but might not be ideal for everyone. On the other hand they offer to kinds of pillows to choose from. For breakfast you're offered with lots of different food and drinks including soy milk, eggs, orange juice, croissants, toast and yogurt. They have charts depicting how crowded the buffet usually is at different oratories to help you decide when to take your breakfast. Excellent room heaters, good breakfast, good bed and clean bathroom. We enjoyed the hotel very much. Good idea with a free glass of wine instead of an unneccessary cleaning during the stay. Breakfast was all right. There was a parking garage which the hotel shared with a shopping center next doors. 24hrs for 10€ with a locked gate and door as well as reserved spots for hotel guests. Staff at check-in and check-out as well as throughout our stay was friendly, helpful and always available. The room was nice and fairly large, the bathroom modern and clean. The breakfast options were decent, as well. Friendly staff. Clean. Easy to get into City and from airport. Holiday Inn Express Hamburg City Centre This rating is a reflection of how the property compares to the industry standard when it comes to price, facilities and services available. It's based on a self-evaluation by the property. Use this rating to help choose your stay! One of our best sellers in Hamburg! This 3-star, non-smoking hotel is in the Hohenfelde district, 10 minutes by train/subway from central Hamburg. Holiday Inn Express Hamburg offers modern rooms with a flat-screen TV. The air-conditioned rooms at the Holiday Inn Express Hamburg City Centre all feature a work desk, tea/coffee maker and private bathroom. Wi-Fi is available in the whole hotel. The Holiday Inn Hamburg is a 5 minute walk from Lübecker Straße subway station. 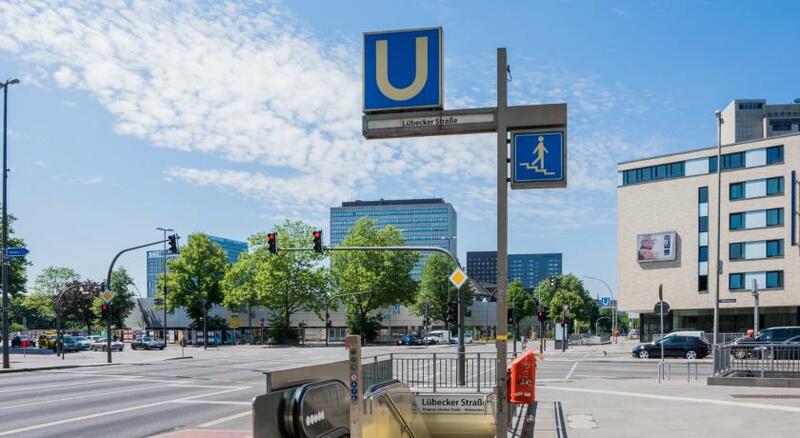 This is 2 stops from Hamburg Main Station and the Mönckebergstraße shopping street. Private parking is available at the Holiday Inn Express Hamburg City. It is 2 miles from Hamburg’s CCH Exhibition Center and 2.5 miles from the Reeperbahn Nightlife and Theater District. Hohenfelde is a great choice for travelers interested in convenient public transportation, city trips and musicals. When would you like to stay at Holiday Inn Express Hamburg City Centre? Modern room decorated in warm tones. Includes a flat-screen TV, a sofa bed (3.9 feet x 6.6 feet) and a private bathroom. Please note that the price is based on 2 guests. The room can accommodate 2 adults and 2 children up to the age of 17. When you are booking, please inform the hotel using the Special Requests box how many children will be staying, and how old they are. Modern room decorated in warm tones. Has a flat-screen TV and a private bathroom. Please note that bed preference is subject to availability and not automatically guaranteed. House Rules Holiday Inn Express Hamburg City Centre takes special requests – add in the next step! Holiday Inn Express Hamburg City Centre accepts these cards and reserves the right to temporarily hold an amount prior to arrival. Please note that guests under 18 years old are required to be accompanied by an adult. Breakfast buffet could be much larger and maybe with a few extra things to choose from. Breakfast was kaos. We was told it would be busy, but it was hard to eat together 4 persons (two small children) when it was SO crowded and waiting time for a table was long. I see it would be hard to expand the buffet, but it was really small verses so many people. Breakfast was usually a zoo. Too many people in too small of a space. Not a great selection. The property was clean and very convenient to some decent restaurants and public transport. The front desk staff were extremely friendly and accommodating. We liked getting free drinks in exchange for forgoing maid service the following day. Great location close to metro stations, nice buffet breakfast (only missed the scrambled eggs from it). The staff was friendly and helpful. The window in our room would not close tightly. Is was loud from that and all of the people in the hallways until 2AM. Couldn't sleep well. TV was very small with poor selection. It was clean and the bed was comfortable. The size of the beds were unacceptable and the room not suitable for a family with two teenagers. And when this issue was raised with staff, they did not seem to care and were nit interested in finding a suitable solution. The stay was really marvelous. Friendly and professional service by all staff. Good continental breakfast. The room was quiet, clean and good for relaxing. The location is convenient because you can easily take the train to the airport (Landwehr Station) or to the city (Lübecker Str). could consider to provide small tooth brush kit and body lotion.